Emilie is living in an 19th century-esque world. She has decided to run away as her aunt and uncle are extremely controlling and always insinuating that she is a wanton women, ready to “whore” it up. She is going to visit her cousin who runs a school, and work there. Only problem, she doesn’t have enough money to sail there. But Emilie is of plucky stock and decides to stowaway on a boat. Unfortunately, she ends up stumbling upon a thief ring and a group of sabotagers. She saves the ship she was going to stowaway on, one belonging to Lord Engal. As the ship sails away, it turns out that they are leaving the country and heading to the center of the Earth. The ship is lead by Lord Engal and Lady Marlende as she is searching for her missing father, Dr. Marlende, his ship damaged inside the Earth. Also on board is Kennar, a Cirathi which is a creature from inside the planet but traveled out to seek aid for Dr. Marlende. When they go inside the Earth, they encounter all kinds of strange creatures, get involved in an underearth war, and find themselves caught in betrayal and sabotage. Emilie is going to have to use every ounce of nerve she has to overcome these obstacles and survive. I thought this book was fantastically written. For those who are a fan of steam punk, Jules Verne, and fantasy stories, will love this book. I thought the characters were all well written and fun. Emilie was a normal girl, who was thrown into incredible situations and able to overcome and work with them. I loved her interactions with one of the sailor/sorcerer Daniel and hope more develops from them. They were hilarious and fun. 1) I hate when books have the character Emily spelled Emilie. For some reason my brain keeps reading it as Emil. It’s not the author’s fault, but just a pet peeve of mine. 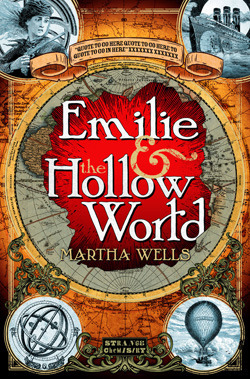 2) I wish the author gave more background as to Emilie’s world (the non-hollow part). The author just drops us into it, but we never get a lot about the culture. I mean I assume it is similar to our earth, but I don’t know. I think the book would be stronger if they gave us more on that aspect. Otherwise, I loved it and recommend it.